Etiquette is an expression, through actions, of one’s mind respecting the other party’s personality, constituting a valuable basic attitude in a person. Individuals gathering together make a group or organization. An organization can be maintained by firmly established discipline. A group of youngsters especially needs far more discipline and order. Etiquette should be based on an upright mind and modest attitude. One should get rid of mean attitudes, showing only modest attitudes, which is an important part of etiquette. Decent and accurate speech, graceful conduct, upright and moderate attitudes are all the essentials of etiquette deserving a healthy modern life. Etiquette is also the source of maintaining harmony and solidarity for a community life. In an attention posture, one bows the head by 45degrees. The upper body should bend at the waist by 15 degrees. The back soles of both feet stick together firmly. If a senior is seated, one should kneel down and bow. When a senior enters, one should rise up, showing courtesy bystanding upright, and then kneels down to bow before the senior. When a senior talks, oneshould take an attitude of listening carefully. The head of the Dojang (Martial Arts School) or an instructor must become a model ofrespectably personality. The head of the Dojang or an instructor must always keep it in mind that every speech andbehavior of his is watched closely and imitated by his trainees. An instructor should be prudent not to speak ill of or slander his fellow instructors and/or his seniors in front of the trainees. The trainees must be infused with a hope, ideal and objective, which will be kept in mind all the time. The attitudes of the chief instructor and assistant instructors should always be clear and candid. Any lie or occasional trick should be avoided. An instructor should not be talkative before trainees. The instructor should pay much attention to the status of trainees’ homes and their troubles, if any, in order to help them improve the situation. The instructor should rely more on consulting than on commanding. The instructor should draw a line between official and personal affairs. 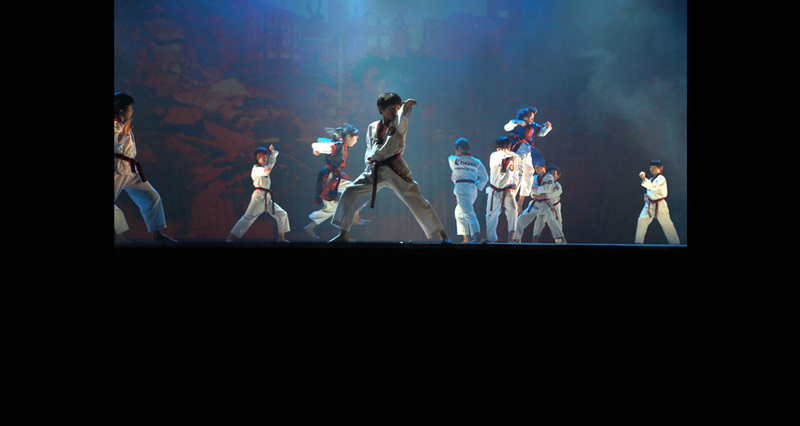 The head of the Dojang and instructors should take the initiative to contribute to the development of the community. 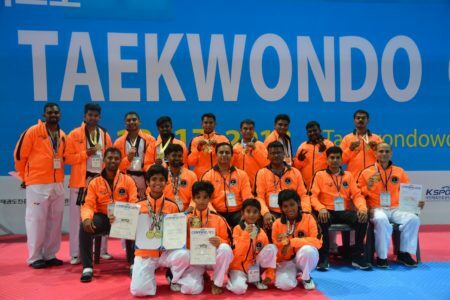 The head of the Dojang, instructors, high Dan grade holders, Dan holders and all other Taekwondo practitioners should endeavor to practice one by one what they have learned about mental cultivation and attitudes such as ethical manhood, justice, faith modesty and non-betrayal in their daily life. Inside the Dojang, one must try to create an atmosphere of quietness and solemnity. The Dobok must be always treated dearly. It is advised not to go out of the Dojang in the Dobok except in the case of urgency. Inside the Dojang, one must use polite language towards the head of the Dojang, instructors and his seniors in rank, regardless of their age. The Dobok must be clean and put on neatly during training. If the Dobok is disarranged, one must stop his actions and turn around to correct his wear. One must always keep himself dressed neatly. A special attention must be paid to whether or not the buttons and the necktie are loosened. One should be in full dress when he attends the ceremonies of competition meets, promotion tests and other events. Neat hair and clean footwear are a must for Taekwondo practitioner. One should habituate oneself to a clean and modest life. One should ensure that his looks and dress will not show off laziness. One should refrain oneself from pursuing fashion blindly. A Taekwondo practitioner must try to observe the Code of Etiquette not only at the Dojang but also in school, social meetings and at home. A Taekwondo practitioner must know how to express the attitudes of etiquette toward his teachers, seniors, colleagues and also his juniors. One must take a polite attitude with the chest opened while sitting face to face with the other party for a dialogue. One should choose refined words in conservation. One should show a smiling look in conversation, heeding not to displease the other party. One should talk logically and calmly in a low tone as much as the other party can hear. The topic must be something attracting the other party’s interest, occasionally inserting humors and wits. One should refrain from using inadequate foreign words. One should be especially careful in calling the other party’s social title. It is important first to listen carefully to the other party’s opinion and then put forth his own opinion. It is undesirable to interrupt the other party while talking. An advance notice is necessary before paying a visit to others, regardless of the other party’s position, high or low. Except for unavoidable circumstances, one should refrain from fixing the time of visit for Sunday or other public holidays, early morning, late at night, or mealtime. One should keep the body upright while sitting at the table. One should refrain from talking while taking a meal, if possible. One should commence eating after a senior has begun eating. Even among friends, the visitor should be treated with etiquette. One should refrain from making a noisy sound while picking up a spoon, drinking or chewing food. One should avoid keeping the mouth opened to be seen eating by others. One may not leave the table during the meal. One should wait at the table, if possible, until the time of ending the meal by the other party. In guiding a senior, one should precede a step forward with a humble attitude.